Matt Triplett won Round 1 of the PBR World Finals with an 89.25-point ride on Little Tucker. Photo: Andy Watson/BullStockMedia.com. 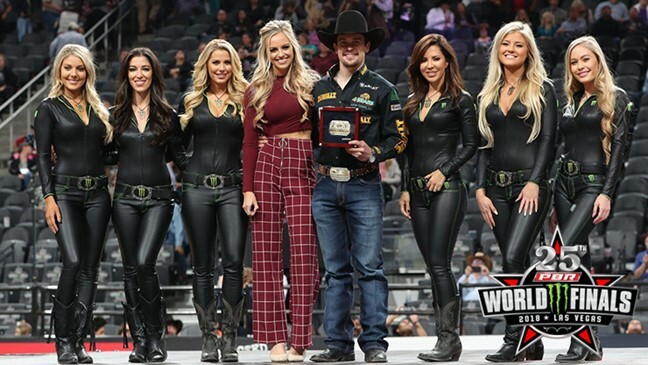 LAS VEGAS – The world’s best bull riders showed up in force Wednesday night in Las Vegas at the most prestigious event in professional bull riding, the PBR (Professional Bull Riders) World Finals. Leading the 13 riders to record a qualified ride during the first round of the 25th PBR: Unleash The Beast World Finals, Matt Triplett (Columbia Falls, Montana) won Round 1, climbing three spots in the world standings from No. 16 to No. 13. The 27-year-old made the 8 aboard Little Tucker (Patterson/Halpain) for 89.25 points to earn $35,000 and 300 world points. Triplett now trails No. 1 Kaique Pacheco (Itatiba, Brazil) by 3,589.16 points. The score is the second highest recorded by Triplett in his five appearances at the PBR World Finals, trailing only his career-best 92-point effort on Big Tex Walk Off (Jeff Robinson) during Round 2 of the 2014 edition of the event. Triplett’s Round 1 ride was his first since he sprained his right wrist during the championship round of the Greensboro elite tour event in October, which the Montana rider won. Eduardo Aparecido (Gouvelândia, Brazil) was second after riding Mr. Majestic (Cordy McCoy/Bruce Wold) for 89 points. For Aparecido, the match-up was familiar, having bucked off the bovine athlete in 5.39 seconds this September at the premier series stop in Springfield, Missouri. By evening his record against the big, white bull, Aparecido earned $20,000 and 180 world points. While he maintained his No. 9 ranking in the world standings, the Brazilian narrowed the gap on countryman and world No. 1 Pacheco to 2,916.67 points. Continuing his perfection inside T-Mobile Arena, 2017 Rookie of the Year Jose Vitor Leme (Ribas do Rio Pardo, Brazil) rode Swamp Wreck (BS Cattle Co./Ace of Spades/Red Laces Cattle Co.) for 88.75 points to finish third in Round 1. The 22-year-old phenom has now ridden seven consecutive bulls at the PBR World Finals after he went a flawless 6-for-6 last season to capture the World Finals event title. Leme netted $15,000 and 125 world points. Still No. 2 in the world, he now trails the No. 1 position by 1,452.5 points after beginning the event 1,535 points back. After a dismal second half, Cody Nance (Paris, Tennessee) returned to his winning form, which included two regular-season elite tour events at the start of the year, riding Blue Crush (McCoy Ranches) for 88.5 points for fourth place in Round 1. Earning a check for $10,000, Nance also collected 95 world points and elevated one position in the world rankings. He is now No. 7 in the world, 2,735.83 points behind No. 1 Pacheco. Mounting arguably the most historic comeback in league history, Chase Outlaw (Hamburg, Arkansas) rounded out the Top 5 compliments of his 88-point trip on AMS 40B (Gary Long/Dean Wilson). Throughout the past month, Outlaw has made a historic climb up the world standings. First, reconstructive shoulder surgery prevented the Arkansas cowboy from competing the entirety of the first half. Then, he was forced back to the sidelines two months after making his 2018 debut following a horrific wreck at Cheyenne Frontier Days where he sustained 30 facial fractures. Since returning to competition on Oct. 6 at the Milwaukee, Wisconsin 25thPBR: Unleash The Beast event, Outlaw has gone 11-for-16 to rise 54 spots in the world standings, up from No. 76, collecting a cummulative 940 world points. While he remains No. 22 in the world standings ahead of Round 2, Outlaw earned $6,000 and 75 points for his fifth place effort in the opening round of the World Finals. After sustaining tears to both his left MCL and PCL during Round 2 of the Velocity Tour Finals on Saturday, Pacheco’s determination to capture his first world title was on full display in Round 1, when he covered Rugby (LeFlore Bucking Bulls) for 87.25 points, tying for sixth place. Lachlan Richardson (Gresford, New South Wales, Australia) matched the world No. 1‘s score aboard his re-ride draw Black Rose (Broken Arrow Bucking Bulls), with each rider winning $2,000 and 42.5 world points. With plans to retire at season’s end, 2008 World Champion Guilherme Marchi (Três Lagoas, Brazil) recorded his 633rd career ride on the PBR’s elite tour to finish eighth in Round 1. His 8-second effort came atop Slam Dunk (Washington/Broken Arrow/Owens) for 86.5 points. Tonight was also the first round of the ABBI Classic Finals. Hocus Pocus(Barthold/Almand/D&H Cattle) earned a first-place finish with 90.6 points after dispatching two-time PBR World Champion J.B. Mauney (Statesville, North Carolina). Halpain/Roth’s Bandit currently sits second with 88.8 points, while Prayer Warrior (Halpain/Roth) is third with 88.4 points. Budakon (Hale/Braun/Grimes/Wallgren Bull Co.) and Proctors Pride (Gary Long/Dean Wilson) split fourth with 88.2 points to round out the Top 5 bulls. Twenty bulls will return for the ABBI Classic Championship Round on Saturday night during Round 4 of the World Finals where the titles of ABBI Classic World Champion and ABBI Classic Finals Champion will be up for grabs along with $200,000 in bonuses. Fans can relive all the action from Round 1 on-demand tomorrow morning, Thursday, November 8, at 8:00 a.m. ET.